Amazing Stories, in its new incarnation as a web site, has announced that it’s teaming up with Futures Past Editions to reprint stories from the long and remarkable history of Amazing Stories magazine. That backlist includes even more vintage science fiction from Amazing‘s companion publications, Amazing Stories Quarterly and Amazing Stories Annual. The eBook and printed editions will bear the comet tail logo of the magazine under the imprint Amazing Stories Classic Reprints. Selected stories will also be published on the Amazing Stories web site: the first of these is Don Wilcox’s The Voyage That Lasted 600 Years (available there now). 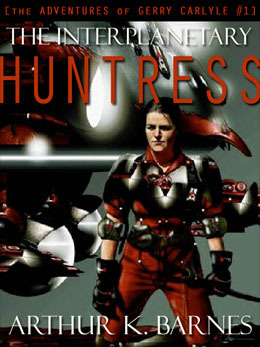 I’ve already got one of the Futures Past eBooks on my Kindle, just waiting for me to get to it: it’s Arthur K. Barnes’ The Interplanetary Huntress (currently a free download at Amazon , Barnes & Noble, and Kobo). Barnes sometimes collaborated with Henry Kuttner, and that’s why I’m pretty sure I want to read him. Kuttner—with or without C.L. Moore—was pretty amazing in his own right. A quick visit to their web site shows that Futures Past Editions is already republishing loads of vintage science fiction and some new titles, too. I look forward to seeing what this co-venture with Amazing Stories will add to that list. 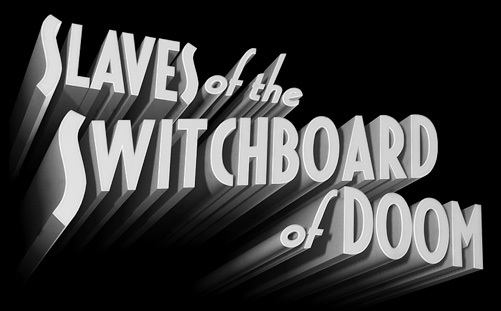 If we ignore the fact that I was just goofing around, we’ll be free to imagine that this is the title card for the Republic Serials version of Slaves of the Switchboard of Doom. There. Aren’t we happier now? I thought so. Now I’ll go and put on my “Better Living Through Mindless Escapism” T-shirt. Meanwhile. . . in the world that is somewhat more real than the one we visited so briefly. . . I’m working on the fourteenth illustration for the book. It’s being mean to me, so I’m playing around with extruded titles. On the querying front: I’m preparing to wind down. The queries that are still out there amount to two agents with the first five pages; three agents with the first two chapters; two agents with the first three chapters; and one agent with the full manuscript. I have two or three queries I’d still like to send in the next week or so, but then I’ll just wait out the agents’ response periods (assuming that they pass on the book) and at last move on to Phase Two, Attack on the Editor’s Tower. Phase Two will involve fewer characters but will last at least as long as Phase One since, well, that’s just how it is. In the frenetically glacial pace of the publishing process, I mean. I can’t say that I haven’t learned anything that I didn’t already know in the abstract, but the realities somehow still surprise me. One does get a sense of what it must be like at the big, open end of the funnel that is the Inboxes of the literary agents. They have plenty more to do, apart from fielding queries, and although they are legion they’re still outnumbered by hundreds to one when you compare them to the hosts of queriers. At the level of editors, that funnel mouth isn’t necessarily smaller. I guess in order to change things you’d need a vastly more profitable business or an army of brilliant, unpaid interns who never burn out. 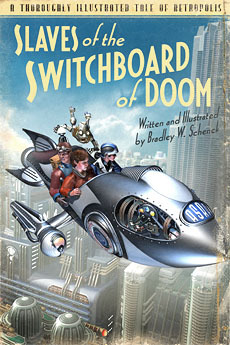 Which, now that I think of it, is perfectly possible in the world of Slaves of the Switchboard of Doom. . . so long as you’re willing to be the villain. Here’s a pretty inspired Kickstarter project for a mobile, Roomba-like inkjet printer. It’ll print on any size paper without requiring a huge framework. While it doesn’t seem all that practical for a 100 page document, there’s a lot of potential here for unusually small or large sheets and, when it comes right down to it, the thing is just a nifty idea that ought to exist. It probably will, too: with 22 days left to go they’ve already raised $390,000 of their $400,000 goal. Vintage Allies has posted an interview with me, which means that they asked me questions and I tried not to sound like an idiot. How did that work out? You decide. In other news, here’s a robot character I’ve just finished for Slaves of the Switchboard of Doom. He’s a minor character, but in spite of that he’s got to be there in one of the illustrations: so here he is. Those illustrations, since you ask, are coming along pretty much on schedule even though I somehow decided to add a title page illustration (it’s nice!). I’m about halfway done with the whole set. That means my ballpark estimate of "sometime in June or July" is still looking good. Of course I’ve got even more robots and control rooms and escalators to model along the way. So, you know, fingers crossed. Oh, and it looks like I found a new (browser specific?) bug that’s whacking out some of the posters people build with the Pulp-O-Mizer. I have to fit a little testing and fixing in there too, then.